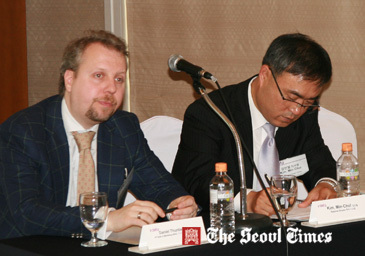 Irdeto's Vice President of Sales APAC Daniel Thunberg (left) speaks in front of the local S. Korean journalists while tnIrdeto's Regional Director Min-Chul Kim listens at a press conference held at COEC Intercontinental Hotel in Seoul on Nov. 17, 2011. The South Korean branch of online security software provider Irdeto held a press conference at the COEX Intercontinental Hotel in Seoul, South Korea on Nov. 17, 2011. There, Irdeto's Regional Director Min-Chul Kim and Vice President of Sales APAC Daniel Thunberg presented their company's flagship software, ActiveCloak, The product is designed to prevent copyright infringement of intellectual property. Thunberg explained that ActiveCloak distinguishes itself from other media security systems because it is based on what he calls "dynamic security," which includes the monitoring of hacker attacks, analysis on attacks, quick response and frequent updates. Conventional media security he explained, was "static" and prone to piracy. Thunberg continued that "[ActiveCloak's] introduction not only protects piracy of Korean movies and dramas which get high popularity around the world, but also fulfills demanding security standards of Hollywood media companies." The added security would benefit not just media content owners, but distributors and enablers. This in turn would entertainment industry’s economy, which has seen staggering losses over the past decade due to internet-enabled media piracy. The protection software operates on various platforms, including smart TV, PC, iOS and Android and provides various types of DRM, Live, VOD and Streaming. This press conference was Irdeto’s first, marking its entry into the Korean market on the same day. Irdeto, co-headquartered in Amsterdam and Beijing, is also a subsidiary of broad-based media group Naspers. In 2003, Irdeto established its branch in Korea that now recently changed its address to Samsung building in Dea-chi dong, Gangnam gu, Seoul Korea. Through ActiveCloak, Irdeto Korea is now trying to increase market share of online security software for digital media contents. The world's 12th biggest music market, South Korea also has some of the strictest anti-piracy laws in the world. Buoyed by high internet penetration, plentiful and cheap channels for legal streaming and downloading of media, "three-strikes" anti-piracy legislation and a surging interest in K-pop, its music sales have remained stronger than those of other countries since 2000, when the emergence of file-sharing services such as Napster began to devil the media industry worldwide.